The 3Com® Switch 4500 family of managed, stackable/clusterable 10/100 Ethernet switches provides secure, flexible LAN connectivity and advanced voice-optimized features such as Power over Ethernet (PoE) and auto-voice VLAN and QoS. The Switch 4500 family offers Layer 2 switching and dynamic Layer 3 routing, as well as robust security, Quality of Service (QoS) and management features to deliver intelligent edge connectivity for essential business applications. This makes the Switch 4500 ideal for medium businesses and small enterprises seeking to build a secure converged network. This switch comes with a limited lifetime warranty. Also provided is Advance Hardware Replacement, with next business day shipment available in most regions. The 3Com Switch 4500 PWR 50-Port has 48 10/100 Power over Ethernet ports and two dual-personality Gigabit ports. Each Gigabit port offers a choice of copper or fiber media: 1000BASE-T (via RJ45) or 1000BASE-X (via optional “SFP” Small Form-Factor Pluggable transceivers). 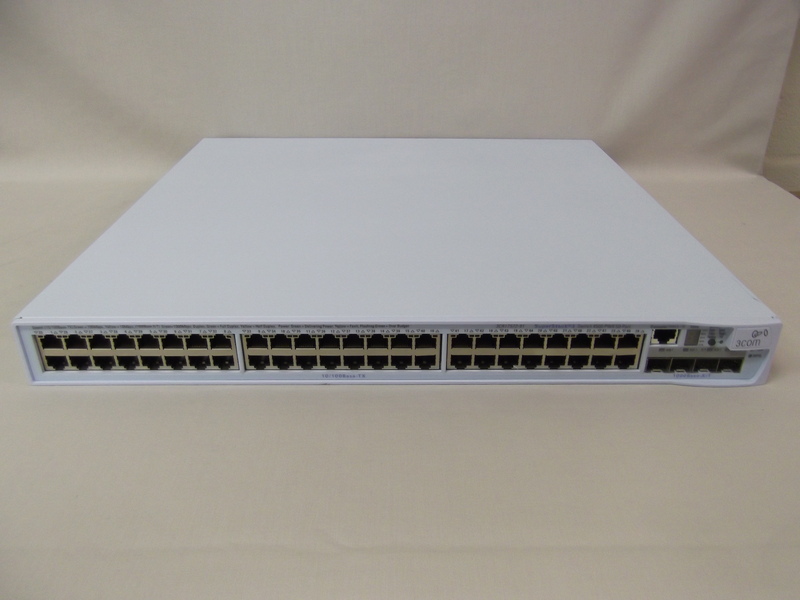 Stack this switch eight-high with other Switch 4500 devices and manage as a single IP addresss, or cluster as many as 32 mixed devices including Switch 5500G, 5500, 4500G, 4500, 4200G and 4210. Unique auto-voice VLAN feature detects the presence of IP phones and dynamically assigns switch ports to the voice VLAN, enabling automated configuration and prioritization of VoIP traffic. This powerful feature helps ensure voice traffic quality, and minimizes the cost and complexity associated with adding or moving IP phones. Enterprise-class security features include IEEE 802.1X network login, SSH/SSL encrypted device login, Access Control Lists and RADIUS Authenticated Device Access (RADA), protecting mission-critical business applications. Distribute aggregated links across stacked units for greater uplink resiliency phones, wireless access points and IP security cameras.